Lac Blanc, at 2352m, is one of the most famous walks in the Alps – hugely popular for its straightforward access to a spectacular panorama over the Mont Blanc massif. It really is an amazing view – the lake and surrounding landscape frame the peaks opposite perfectly. There is often snow around at the lake in summer, though in hot years there may not be. Allow around 4-5 hours for the walk, including time to explore around the lake and take photos. You may well see ibex along the way! At first glance, it seems clear that it would be better to go from Index (2525m), the highest point accessed by a lift. However, it’s worth noting that this is a much harder trail to walk on, running over loose scree with a lot of up and down along the way. Experienced walkers will usually be fine but it’s not necessarily the easy option it appears at first glance, and may not be suitable for small children or the less fit. It also can be inaccessible even in summer, as it’s around the same height as the lake and can have dangerous hard packed snow (névé) in the couloirs. If you walk from the Flégère mid station (1913m), it’s a straightforward walk on an easy trail but with a climb of around 500m. You can either walk directly there or via Lac Cheserys, which is rather longer but also slightly easier, on a maintenance track for part of the way. To go from Tré-le-Champ makes it into a beautiful full day for those who’d like more of a challenge. Walk through a lovely open larch forest which is good place to see wildlife, and then take one of two variants. Either via the Aiguillette d’Argentiere, which takes you past a beautiful climbing crag, or the easier route via Chalets des Cheserys. NB There are laddered sections on the Aiguillette variant, it is recommended for experienced and fit walkers only. Here’s my separate page covering this walk. Snow levels and ease of access varies wildly from year to year. Sometimes you can get there in mid June, sometimes it remains difficult well into July. It’s best to check with the staff at the lift station and ask which route they recommend. 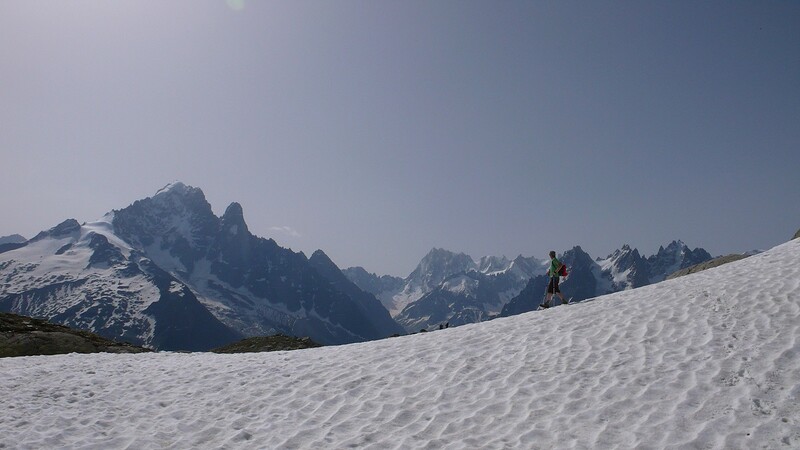 In June or September, you should check with the Office du Haute Montagne when planning, as it can be inaccessible. There is a pleasant refuge at the lake where you can get drinks, snacks and simple lunches. By far the nicest thing to do, I think, is to take sandwiches and find a quiet spot away from the crowds – you don’t generally have to go far. It’s really much better to do it first thing in the morning. Once you’re above the mid station it’s a true high alpine environment with little shade or greenery, and the heat can be fierce. It also gets very busy, especially at weekends – well worth getting up early for some peace and quiet! – Amazing panorama reflected in the lake – photos really don’t do it justice. – Ideal for less experienced walkers, older people and families. It doesn’t have much of the precipitous drops of many trails, the “out and back” route is not committing, and the path from Flegere is very straightforward walking and well signed. – Can be extremely crowded. Not a place to go for Alpine peace. – Beautiful but somewhat bleak on the higher route from the Index, not so many flowers and few trees. If I had time for one or two walks only, this might not be one of them. I think the Balcons are prettier and have nicer trails, with essentially the same views. For high rocky alpine beauty I prefer Lac Noir and the Col des Glieres. But this is being very picky! It’s got to be in the top ten, and if you get there early it’s a magic spot. A nice sense of achievement too, with the climb. If you are fit, it is completely feasible to link it with other walks and I highly recommend this. – Combine with the Grand Balcon Sud. Probably my favourite option. A big day, but doable, and you can always bail at Flegere if you like. – Could be combined with Lac Noir for a full traverse of the south side. To do this would be a very big day, though it is certainly possible for a fast walker or trail runner. It wouldn’t allow much time for photo taking or just absorbing the view, however. Of course, it’s relatively straightforward to split it up via the cable car stops and take as long as you like! These walks are all ones that I’ve enjoyed myself, and they are here to help you with inspiration and planning. 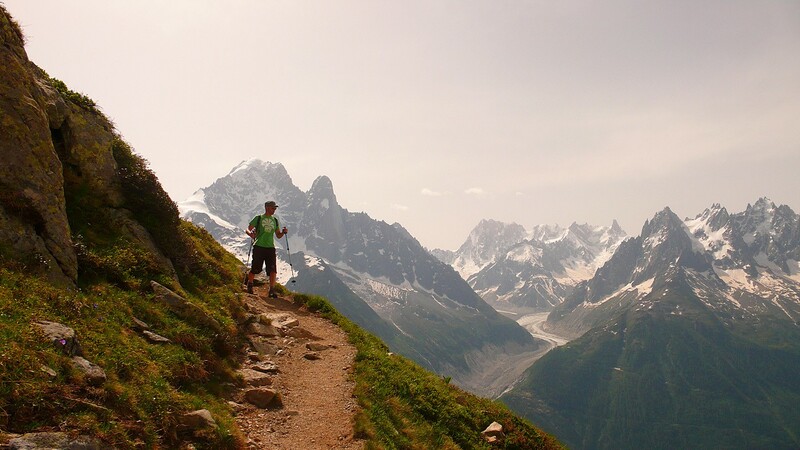 It’s not intended to be a full guide to each walk and I really recommend a book such as Mont Blanc Walks: 50 best walks and 4 short treks (Cicerone Guides) or Mont Blanc Trails (with accompanying map). If you’re staying with us, we have copies which you are welcome to borrow. If not, they are easily available from bookshops in Chamonix. These are summer walks only – and conditions can vary wildly through throughout the summer. Please read my accompanying post on walking safety, and happy trails!